Opening for Thao was Before the Brave, and they were quite taken with the crowd they were playing for. A local San Francisco band, they had their supporters in the audience. Their folk rock was led by Jason’s singing with some great harmonies from Beth. A band to keep an eye on. Up next was Sallie Ford & The Sound Outside. They started out their set with an instrumental that laid the ground work for their ’60s surf pop/ psychedelic sound. They played mostly songs from their new release Untamed Beast. Look for them out on tour with Thao & The Get Down Stay Down. To finish off the night Thao & The Get Down Stay Down took the stage and rocked GAMH. They also played mostly songs from their new release, We The Common. 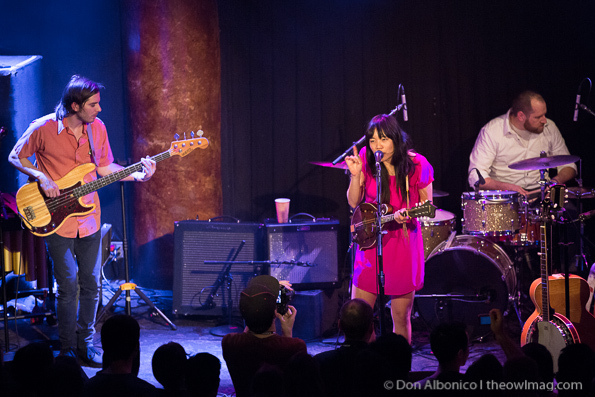 Thao was switching between mandolin, banjo, and guitar with the occasional trip to the drum set to play cymbal. She had a horn section with her and a set of vibes on stage to fill out her sound. Look for an exciting show with Thao putting it all out their for the audience. All three acts have new music out that is surely worth a listen.